Today at Google I/O, we announced Google+ Events, a new way to create, capture and share public and private events. Google+ Events are seamlessly integrated with Google Calendar to simplify the planning process, so you’ll always know when you have something coming up. 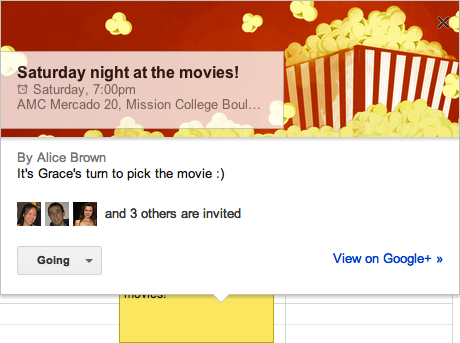 When creating a Google+ event, you can check your Google Calendar to make sure you pick the best time to party. Google+ events also sync to your mobile device's calendar, so you can have them handy when you are on the go. In week and day views in Calendar, you’ll recognize Google+ Events by the event owner's profile picture. When you click to expand the event in Calendar, it displays a beautiful theme and allows you to set reminders, see other guests, and respond to the event. Clicking ‘View on Google+’ takes you to the event page, where you can exchange comments with other guests, view photos, and more. Learn about Google+ Events here, and see our post on the Official Google Blog.